UCD came into the game in third spot after losing at home to title rivals Cobh Ramblers. After an early exchange of chances, Maxi Kouogun had the ball in the Athlone Town net from a Gary O’Neill free kick but the goal was ruled out for pushing. As the half wore on UCD started create the better chances, Josh Collins supplied forwards Cian Kavanagh and Jay McClelland on separate occasions, but Athlone ‘keeper Igor Labuts was equal to the challenge. After a ball over the top, UCD’s leading scorer Georgie Kelly almost pounced for the opening just before the break but again Labuts was there to deny him. Athlone made their second substitution a couple of minutes into the second half and had the first chance when Irish Universities International and scorer of Athlone’s goal in Belfield Jason Lyons header was saved by Niall Corbet. UCD started to wind up the pressure. One chance was cleared off the Athlone line, Labuts saved from a certain Greg Sloggett goal. When the ball goes back into the box Liam Scales header is once again saved, then from an ensuing melee Josh Collins scores, the linesman ruling the ball had crossed the line. Athlone came back looking for the equaliser, but Corbet keeps UCD ahead. First Conor Barry’s direct free-kick put out for a corner, then David Brookes speculative shot from 30 metres is tipped over by Corbet and UCD Fans breathed a sigh of relief. Back come UCD and ball up to Kelly, he made some space and shot past Labuts. His seventh league goal and the Division’s joint-highest with Kieran ‘Marty’ Waters of Cabinteely. 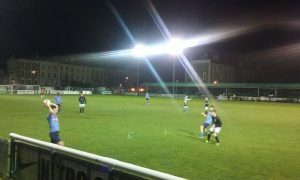 Dan Tobin playing up the wing from his usual right-back position let in Kelly whose shot Labuts had to get down to save. UCD manager Collie O’Neill made a double substitution with Sean Coyne and Conor Crowley on for Evan Osam and Kavanagh. UCD ran out the game and find themselves back amongst the top two with Cobh Ramblers v Waterford to be played Saturday evening. 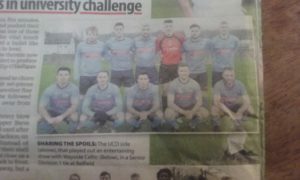 UCD AFC: Niall Corbet, Josh Collins, Evan Osam (Sean Coyne 75’), Liam Scales, Maxi Kouogun, Greg Sloggett, Dan Tobin, Gary O’Neill (c), Georgie Kelly, Cian Kavanagh, Jason McClelland.